Quest Nutrition Quest Bars Review – Is it worth the price? Who says that great nutrition has to taste awful? We’ve had our share of supplements that taste terrible, especially muscle building supplements. Thankfully, supplement companies came up with a way to help bridge the gap between indulgence and nutrition with products like nutrition bars. When protein bars first came out, it was a huge hit – everyone seemed to love eating protein bars. Soon enough, protein bars tasted like candy bars, and even more people bought into the candy protein bar craze. However, not all protein bars are created equal. Some are even enhanced with unhealthy ingredients just to taste better. Quest Nutrition Quest Bars are one of the most recognizable protein bars on the market today. 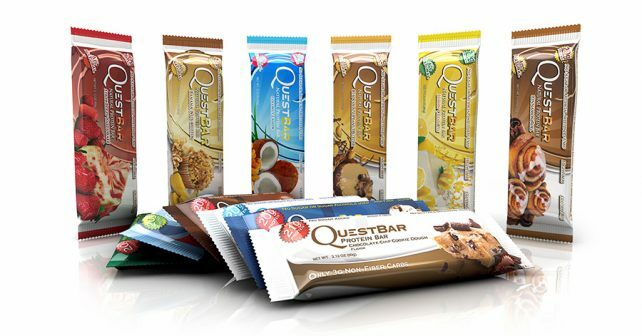 Thanks to an effective marketing team, Quest Bars have made rounds in various health and fitness websites, making their product even more popular. It is marketed as the #1 Protein Bar in the market today, but of course, that’s up for debate. In this review, we’ll dig into Quest Bar to figure out if it indeed has what it takes to be an effective product. Protein bars are made for different purposes. Quest Bars are marketed to replace or supplement protein powders to meet the protein requirement of an individual. Quest Bars do not only contain protein, but other nutrients as well. It’s important to know that Quest Bars contain 200 calories per serving. Those who are going through their cutting phase might want to choose another source of protein to avoid fat buildup. Who uses Quest Nutrition Quest Bars? Protein bars are a great alternative to protein shakes, which can be quite troublesome to prepare. Since protein bars like Quest Bars are individually packed, it speaks to the convenience of being able to consume protein without having to prepare and consume a whole serving of protein shake. Also, protein bars like Quest Bars are consumed by people who would like to think that they are consuming healthy products while indulging their sweet tooth. Quest Bars are famed for its high fiber content, which stands at 18 grams, and its protein content which is at 20 grams per serving. This is just below the average protein content of protein shakes, which makes it a good alternative to protein shakes. However, it’s important to understand that protein bars increase your calorie consumption. If you’re targeting a caloric deficit diet, Quest Bars may not be the right product for use. It’s also not recommended to replace a full meal. The staggering 200-calorie content of Quest Bars is attributed to the various ingredients added to the formula to make the product taste great. It really depends on what your targets are, but unless you are planning to increase your body fat, this product may not be the one for you. Quest Bars give you a nice alternative source of protein in a scrumptious product that tastes much like your regular candy bar. If you want to indulge yourself without thinking too much about its drawbacks, then you might want to add Quest Bars to your supplement regimen. The protein content in Quest Bars is not enough to make your muscles grow fast. If you’re looking for the best muscle-building supplement, make sure to check out NitroGenix 365.